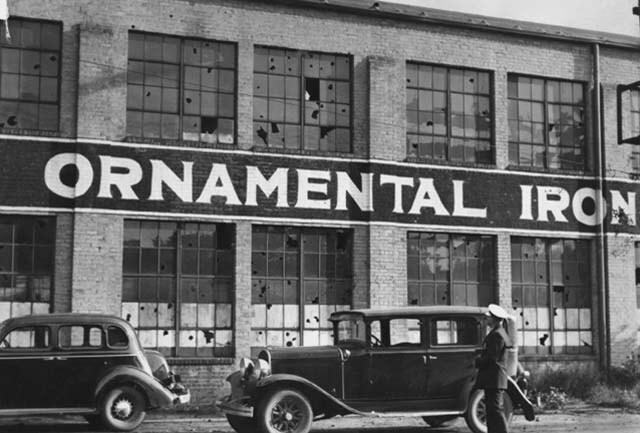 An article by Drew Shonka about an AFL strike at the Flour City Ornamental Iron Works in Minneapolis, which left 2 dead and dozens injured after police opened fire on pickets after street fighting. On Sept. 11, 1935, two people were killed by Minneapolis police near Seward's Hub of Hell at 26th Avenue and 26th Street. At that time unions and workers were organizing, and business owners organized against workers with their own 'union', the Citizen's Alliance. Labor protests in the city had been violent and numerous following the trucker's strike the previous year. The area surrounding the warehouse/industrial complex now known as the Ivy Building, 2637 27th Ave. S., was blue-collar and working class. Industries employed laborers who kept the many bars busy. Gangsters were reported to be living on undeveloped land near the railroad line, holding residents at bay with the threat of violence. The Flour City Ornamental Iron Company occupied the Ivy Building at the time. Here the workers went on strike and protested, and the police responded with tear gas and bullets. The confrontation was described as one of the most violent in the history of the city. The owner of Flour City Ornamental Iron Works, Walter Tetzlaff, was an active member of the Citizen's Alliance. He was vehemently opposed to unionization. The International Association of Machinists was attempting to organize the workers. Citizen's Alliance spies, who worked alongside organizers, gave the names of participating employees to Tetzlaff, who fired them all. The machinists union continued to press for a minimum wage, with the guarantee of an eight-hour day and time-and-a half pay for overtime. Tetzlaff continued to refuse, and in July 1935, workers at the Flour City factory went on strike. In September, strikers escalated their protests. Tetzlaff had hired replacement workers from Chicago. Against city ordinances, he housed the strike-breakers inside the factory complex. "that you take immediate steps to prevent the gathering of such a mob, definitely planned. We are giving you this advance information in plenty of time for you to prepare your police department and give such orders and instructions as will prevent a recurrence of these riotous demonstrations that have heretofore taken place, including last night?s affray. We demand for our firm and our employees your immediate cooperation. The police did show up that night. At 9:30 p.m. there were about 300 pickets. Their numbers were bolstered when several hundred members of Local 574, the trucker's union, joined. The number of police grew, as 100 officers arrived in squad cars, on motorcycles, and in armored cars. Though there were 1,200 men working at the factory, by the end of the night 5,000 workers and nonworkers were facing off with the police. Four police officers attempted to arrest a man who had been seen throwing a rock through a factory window. Pickets enclosed the police and demanded they release the rock-thrower, which they did. Police then let go the first blast of tear gas, shot from an armored car at a crowd of protesters. They moved down the block, revving their engines, and firing guns over the heads of the crowd. Men, women and children were forced between buildings by approaching cars and trucks. Alleys were cleared and the crowd dispersed, but the crowd regrouped, and this time rioters fought hand to hand with the police. The Tribune reported that "in the charge, police did not discriminate between pickets and spectators. Several persons living near the plant were driven from their own lawns." Marjorie Hall was 13 at the time, living at the intersection of 26th Avenue and 26th Street. "We were sitting on our front steps, my mother, sisters, and brother, listening to the racket," she said in a recent interview. "We then saw men running after men. It was hard to tell who was who. The ones who were chasing the others had clubs. Those who were chased came onto our steps, looking for a safe place to be." Yes, I tell you how I saw it. I saw people standing there like it was in my church it was so quiet. I belong to the Pentecost Church. It was on the corner like it was in my church... It was so quiet that I don't know a strike was there. I could see nothing. Then I heard a shot. I thought it was something else, and then it came again a second time, and then there came right there on the corner where I live, people standing all quiet, a rush, and my heart almost stopped beating. The people started to run up in my yard and I bet I had a hundred people there. One of the cars then came close to the house, then I took the people inside so they could get away from this. Then comes the police with the shotguns, running, I don't know how many, about 15 or 20 of them, and then shots. I started back in my house and started to pray to God that if I was able, that no soul should be harmed in my house. The police were shooting and I heard screams and then I heard, I don't know, I think it was the ambulance was taking two people right away from between my house and the next house. Right on the porch they was shot. Then after I thought everything was quiet and I went to the window and then I stepped to the side and then there was a pain in my arm. It was a shot from the window. At one point the clouds of tear gas were so thick that bars were forced to close. The crowd was so dense that streetcars could not move through it. Frances Olson received a charge of shotgun slugs in her shoulder. Stella Thompson was struck in the face with a gas bomb while she was alighting from a streetcar. Inspector Frank Bleed was treated at General Hospital for a badly gashed leg struck by a stone. Another policeman was hit with a flying bottle. By the end of the night, two were dead and at least 28 were injured, according the newspaper. The home market for ornamental steel was not strong in 1935. Tetzlaff's largest contract was with the U.S. government, producing parts for armaments. In October, the federal government threatened to pull their contract with Flour City unless they began producing by the end of the following month. Tetzlaff was forced to accede the 40-hour work week, 25 cents per hour wage and overtime pay to the workers. This was a victory for labor, but Tetzlaff still refused to recognize the union. Just stumbled upon this today during a look through Teamsters Local 574 history. In addition to formerly working in a warehouse right across the street from here, I spent New Year's Eve a couple years ago in this exact building. I had no idea it was the site of labor struggle.